SANTIAGO DE CUBA, Heavy rains that lasted some 20 hours caused rivers to burst their banks and cut road communications among the towns scattered throughout the coast in Eastern Cuba, an unprecedented event according to locals. The head of the Risk Reducing Management Center, Julio Hopkins, told ACN news agency that the water accumulated in the nearby Sierra Maestra mountain range descended with such force that knocked down the El Peladero bridge, when two of the center collapsed. Road traffic was stopped in this area, and until the waters recede they will not be able to assess the damages, said Hopkins. This situation prevents the inhabitants of towns such as Limoncito, La Mula, La Plata, La Magdalena and El Macho from reaching the municipal main locality. 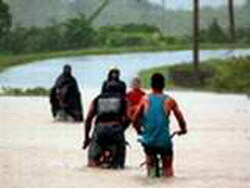 Reports from damages in the Uvero town, which the river crossed around midnight on Sunday, were issued by the Civil Defense, along the evacuation of 82 people. A similar event took place in the municipal main town, where the Guama river flooded the milk processing factory, and ice making facility, as well as housing facilities causing over a hundred people to evacuate to safer areas. In 2008 and 2009, the sea waters penetrated in the Chivirico area, also cutting road communications with Santiago de Cuba city, but to a lesser extent. The Civil Defense reports no human losses.